I am in LOVE! 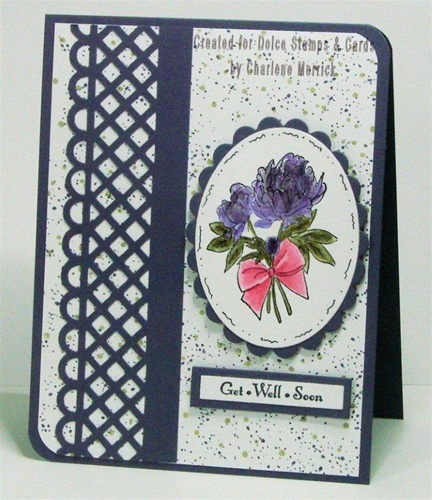 Yes, in love with the Just Rite’s Beautiful Blossoms Set, the Mini Sentiments and Custom Tag Dies! I just couldn’t decide which floral image to use first, so I decided to make an all occasion gift set of four cards. I water colored the flower images with reinkers and a watercolor brush. Once they were dry and cut out using the oval Nestabilities, I applied Crystal Lacquer for added shine to the flowers and leaves. I was able to add the white dotting on top of the Crystal Lacquer (once dried, of course) with my white Galaxy permanent marker. 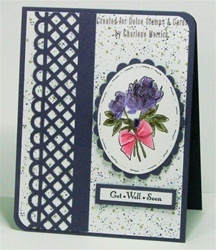 I really wanted the focus of my cards to be on the Beautiful Blossoms images, so I kept my layers to a minimum and did not add any embellishments. I made my own background designer paper using Itty Bitty backgrounds in the coordinating colors for each card.